With Valentine’s Day just around the corner, now is the time to plan some fun family activities. 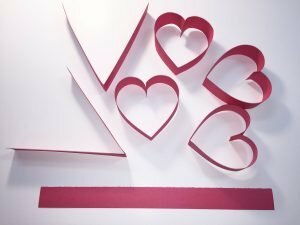 Whether it’s for a Valentine’s Day party or just some fun household decorations, here’s a few simple, fun and inexpensive Valentine’s crafts you can do with your kids. Sponge-Paint Valentine’s Hearts Buy some inexpensive kitchen sponges and cut heart shapes from them using scissors. Cut the shapes in various sizes. Then mix up some paint in shades of reds and pinks. Stamp the paint on one side of a sheet of construction paper. Experiment with different sizes and colors of the heart-shaped stamps. Then cut the sheet of paper in half. 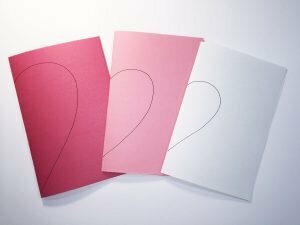 Fold each of the two halves to make Valentine’s Day cards. 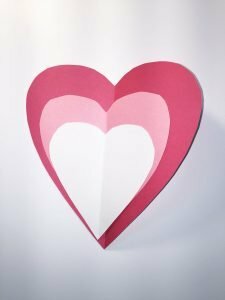 Cut-Out Heart Decorations Fold a sheet of construction paper in half. On the folded side, draw half of a heart shape. Cut the shape out, open the fold and you have a heart. Experiment with using different sizes of paper, and drawing different shapes of hearts. Try stringing the hearts together to make Valentine’s garland or glue them onto a larger sheet of paper to be hung as a decoration. See photo below. Banded Heart-Shaped Decorations Cut a sheet of construction paper into one inch wide strips, going lengthwise. Fold the strips in half. With the open ends, form a heart shape, and staple to close. You can string multiple hearts together to make hanging decorations. See photo below. Valentine’s Day Treats For a Valentine’s Day breakfast, make some regular pancakes, then use a heart-shaped cookie cutter to cut them into bite-sized heart-shaped pancake pieces. For a fun Valentine’s Day after-school snack, cut an apple into slices. Then use the cookie cutter, to make-heart-shaped holes in the slices. Spread some peanut butter in between two slices, to make Valentine’s Day apple sandwiches. A fun fruit cabob can be had by simply using the cookie cutter to cut some heart-shaped pieces of melon, and spearing the melon pieces through the kabob stick.